In awareness of October’s LGBT History Month, SU Libraries is collaborating with SU Public Humanities Committee and student organizations LGBTQ+ Alliance, Sexual Health and Advocacy Group (SHAG), and Sexuality and Gender Awareness (SAGA) to host several events. The programming centers around bringing a section of the historic AIDS Memorial Quilt to be exhibited on campus, across from the Library Service Desk in the Guerrieri Academic Commons for the month of October. See below for a full schedule of events. October 5: 5:00-6:30pm A reception with refreshments in honor of the Quilt, 2nd floor of the Cafe in the Guerrieri Academic Commons. In partnership with SU Libraries’ Diversity & Inclusion Committee, SU student organizations LGBTQ+ Alliance, Sexual Health and Advocacy Group (SHAG), and Sexuality and Gender Awareness (SAGA) are hosting a section of the AIDS Memorial Quilt that will be on exhibit for the duration of October, in observance of LGBT History Month. Two exhibit panels will be on display alongside the Quilt to provide information on AIDS/HIV and the Quilt’s history. A reception with refreshments in honor of the Quilt, 2nd floor of the Cafe in the Guerrieri Academic Commons. 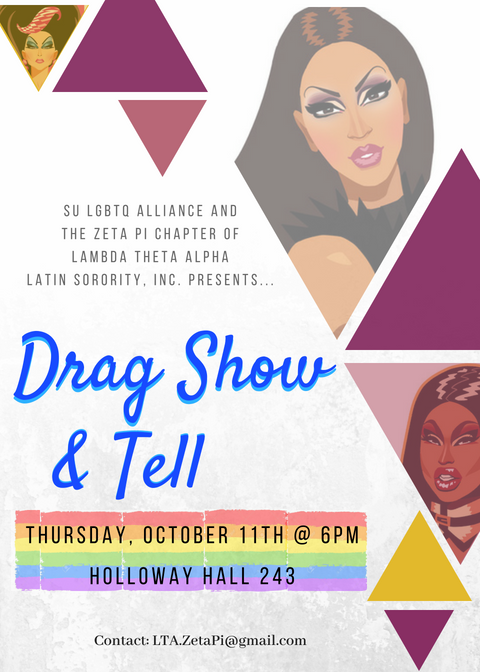 Our partners, the LGBTQ+ Alliance, is cohosting a Drag Show in honor of National Coming Out Day. Please note the room change--the event is in Henson Hall, not Holloway Hall. “MAJOR! 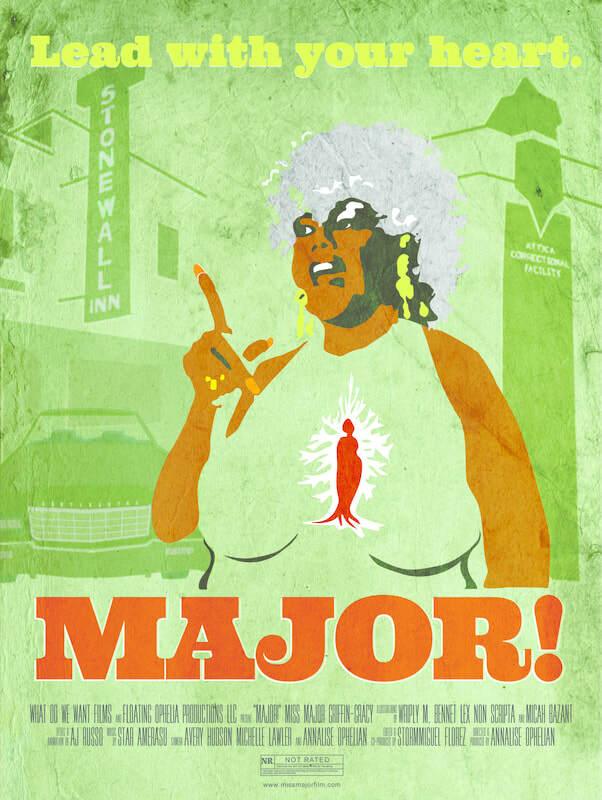 explores the life and campaigns of Miss Major Griffin-Gracy, a formerly incarcerated Black transgender elder and activist who has been fighting for the rights of trans women of color for over 40 years. Join us as we present and discuss the stigma and danger of being queer during the ‘80s and ‘90s — including topics such as AIDS/HIV and Don’t Ask, Don’t Tell — to revive the dialogue for a new generation. A panel of experts will lead the conversation, followed by questions from the audience. SU faculty member Dr. Diane Illig (Sociology) will moderate the discussion. Panelists include our guest speaker, Dr. Tamar Carroll from Rochester Institute of Technology; SU faculty members Drs. Michele Schlehofer (Psychology) and Brandye Nobiling (Community Health); and SU graduate assistant Mr. Ken Forest. 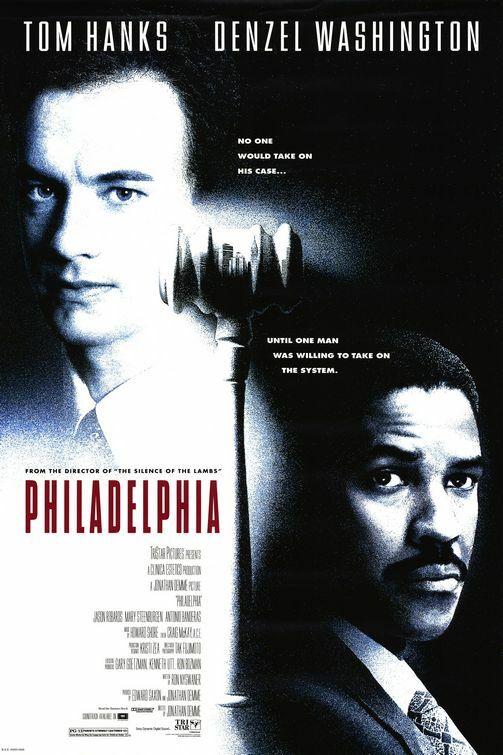 “When a man with HIV is fired by his law firm because of his condition, he hires a homophobic small time lawyer as the only willing advocate for a wrongful dismissal suit." Hosted by Dr. Elsie Walker (Department of English, Salisbury University), specialist on political cinema and film music, author of Understanding Sound Tracks Through Film Theory (2015) and Hearing Haneke (2017), both with Oxford University Press.